3. We do not have a health care crisis. Much media attention has been given to our “health care crisis”. We must change our frame of reference. We have a food crisis. If we eat better, we will feel better. It’s that simple. While most of the focus has been on the obesity epidemic, we need to address the food issue. 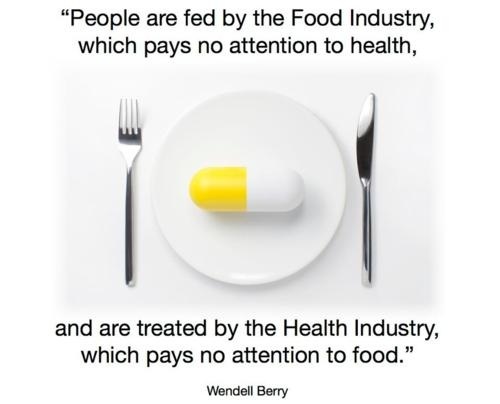 Begin with the food, pass over obesity and go straight to disease. Obesity, like many other topics are distractions – Horrific food = Disease. The above quote was made by Wendell Berry. To hear more from Mr. Berry, click the above picture. The American diet is a catastrophe. We don’t have a health care crisis.